Yellow Archangel is one of the classic woodland wildflowers. By that I mean it is very much associated with ancient woodland sites. I have some growing in my section of Ninewells wood, unfortunately it has variegated leaves and is almost certainly and escapee from local gardens. In fact it was probably purposely planted there as a previous resident of one of the little cottages, close to the woodland, had a penchant for ‘beautifying’ the woods and he planted Spanish Bluebells, Aquilegia, Forsythia and Daffodils. I have more or less eliminated the Spanish Bluebells and the Forsythia but have yet to get to grips with the others. The veriaged form is called Lamiastum galeobdolon subsp. argentatum and is very invasive and difficult to eradicate once established. I digress that is another story. There is a list of wild flowers which if you have them in your woodland point to it being an ancient woodland. Check it out at Indicator species. Yellow Archangel is number 20 on the list. 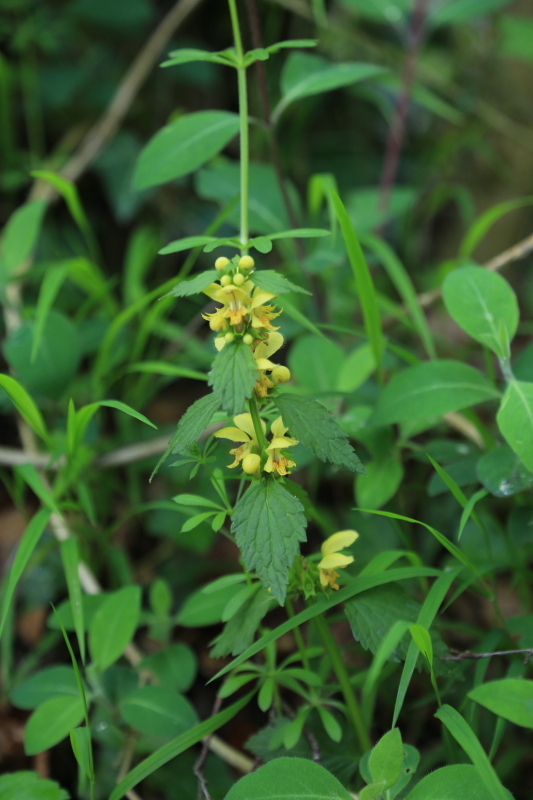 There is lots of proper wild Yellow Archangel growing in the hedgerows and woods around the Wye valley, it is a member of the nettle family and has flowers which are very similar to white dead nettle except that they are yellow. Also all of the nettle family, properly called Labiates have stems which are square in cross section. Next time you come across some nettles, pick a bit and have a look at the stem shape; Incidentally there is a suggestion that regular stings from nettles can reduce the risk of arthritis in old age…… I should be OK then. The flowers do have a bit of orange in them as you can see in this photo, and they do look quite attractive up close, but they are quite small. These orange lines are called honey guides, many flowers have lines or spots on them to direct pollinating insects to the source of the nectar. Note to myself….I should remove sticks and debris before taking photos. The name Archangel is a bit odd and comes from the shape of the flower.The flowers have two ‘lips’. The upper lip is sometimes described as being helmet shaped, and the lower lip carries the markings mentioned above. Each individual flower is said to be shaped like an angel, though I do not recall that angels wear Helmets?? The plant produces seeds and is dispersed and propagated by the seeds, it can also spread slowly by creeping underground rhizomes, rather like stinging nettles do. It is found more or less all along the Wye valley and into Monmouthshire but seems to have died away in much of Gloucestershire, its distribution is quite southern. It prefers damp soils.